I am a big Radley fan, I currently have 4 Radley bags that I'm currently using ( sad I know, I've taken over a space in our hall to house them). Here we have a New - Navy Blue Radley Large Tote Bag With Dust Bag. Bottom of the bag has 4 protective studs and a Radley Dog. Smart Radley tote bag. The bags can be clipped on either side. New Radley bag in black leather with shoulder strap and dust bag. The bag has one inner zipped section and two open sections at either side. There is also a small pocket on the back. Comes from a smoke and pet free home. DUE TO TO THE VALUE OF THE BAG IT WILL BE POSTED BY SPECIAL DELIVERY WHICH IS TRACKED AND INSURED. Detachable and adjustable shoulder/ crossbody strap. This classically structured bag is crafted from smooth leather, black in colour and gold-toned hardware. This bag has been used but it is still in beautiful condition. RADLEY “KENWOOD" OILCLOTH ZIP BAG WITH AN ADJUSTABLE SHOULDER STRAP. SHOULDER BAG. ALL PROCEEDS FROM SALE GO TOSALLY'S CAT RESCUE I N CORNWALL. Black Radley tote bag. Comes with a metal Radley dog attached to the bag - which can be removed - and has a little pocket it can hide away in. Hardly used ( perhaps taken out 3 times...)and therefore in excellent condition. Two zipped compartments inside the main bag and a main zip too. A single pocket on the reverse. The strap is detachable. I only sell items it be pleased to receive myself. From a smoke free home. UK postage only. No international bidding. Features little knot detail to the front on a flap to a inside pocket, which closes by a magnet. and the item is not new. LEATHER MULTIWAY BAG. a zip to the insides has zip and slip pockets. includes a dust bag. 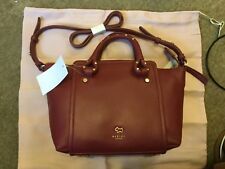 RADLEY LARGE TOTE BAG & PURSE. TAN LEATHER. Crafted from textured leather and soft suede. Pin stud details. Strap Drop Length: handle 11cm, strap 58cm. Internal splatter spot lining. Detachable and adjustable cross body strap. RRP £59 for handbag and RRP £16 for tote bag. Shoulder strap. One inside zipped pocket and 2 open pockets for phone etc. One outside pocket. Radley Limited Edition Signature Leather Bag & Purse - '20th Anniversary' - NEW picture to be added. Condition: Brand New with tags Item is brand new, however is slightly pressed due to storage(see last picture), it does not affect its condition or value, as it is a soft bag anyway, just mention it to be completely honest. Hence the price. What you see is what you get. No return. Size: Width 29.5cm x Height 26m x Depth 11cm Medium Grab Bag. Very cute and popular design, sold out everywhere! No return. Radley Signature/Picture Bag & Coin Purse - '20th Anniversary' - NEW. External Features: The bag has a zip fastening. Grab handles and longer detachable and adjustable shoulder strap. Slip pocket on the back of the bag. Crafted from quilted fabric the ‘Charleston’ zip-top bag has a streamlined design that can house a laptop and all your work essentials. Lined with a vibrant splatter spot print, the interior of the bag is detailed with a secure zip pocket, two slip pockets and a signature Radley dog patch. Internal 1 phone pocket, 1 zipped pocket and 1 other pocket. In excellent condition in original dust bag. Radley Limited Edition Signature Leather Bag & Purse - '20th Anniversary' - NEW picture to be added. Condition: Brand New with tags Size: Width 29.5cm x Height 26m x Depth 11cm Medium Grab Bag. Very cute and popular design, sold out everywhere! No return. With protection dust cover bag. RADLEY “SPOT AND STRIPE” OILCLOTH ZIP BAG WITH AN ADJUSTABLE SHOULDER STRAP. Style Tote. 1 interior zip pocket & 1 slip pocket. 10-1/2"L strap. Closure Zipper. Brushed light gold-tone exterior hardware & 1 back slip pocket. Brushed light gold-tone exterior hardware. Zip closure.